Massage Tretinoin into each individual stretch mark immediately right after rolling/needling. Let it penetrate the skin for some minutes and then apply a little Infadolan over the entire rolled area. Do not apply Tretinoin right after dermarolling for acne scars. Start applying when the skin has healed from rolling/stamping /needling and only apply about three times a week. 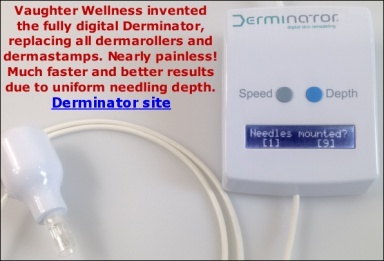 Dermarolling speeds up the turnover of the skin and this could theoretically improve seborrheic dermatitis but it is just my theory and I certainly do not recommend dermarolling over the skin that is severely affected by seborrheic dermatitis because dermarolling may also make it worse. I really do not know. As you stated, there is almost no information about it and we do not have one single customer who tried it (at least not that I know of) and I have never recommended anybody to try it. Dermarolling should only be performed on skin that has no serious disorder- such as Psoriasis, severe Rosacea, eczema, severe active acne, fungal infections etc. If you have acne scarring, buy a 1.5 mm dermastamp and target only the scars. Yes, I think the unpredictable, impaired healing (the skin is prone to heal with scars) while on Accutane and some time after the treatment had been stopped is at least partially due to thinned and dried out skin but there might be many other effects of Accutane that contribute to it. Lots of Accutane users notice their skin easily scars but not everybody and I am not against taking Accutane because there are also very many happy users. Thank you Kat, for taking time to describe your experience. The suction method can work for indented scars in conjunction with any type of microneedling. Nevertheless, targeted treatment is the best: Single needling or dense dermastamping to loosen the fibrotic strands and then keeping them loose with suctioning. I am afraid I cannot advise you the best method concerning the tape. In the study, they used a professional machine, producing a very strong underpressure (it caused bruises). The suction machine is too expensive for home rollers to buy so I was thinking about an improvised solution and a strong adhesive tape that you repeatedly stick to your scar and lift it up was one of my suggestions but it is not and ideal solution because it is not strong enough. and then look at the images. There you can find US vendors that sell a variety of relatively cheap vacuum pumps. Forum member Arachne describes an interesting suction method improvisation in the forum thread called "Indented forehead shingles aftermath". I asked him whether he could post his method and experience in the suctioning thread and I hope he will. If the skin is still "raw" a day after microneedling, do not apply make-up foundation. If you are prone to acne, apply Infadolan on your face immediately after dermarolling with long needles (> 0.5mm) and then switch to a cream that you normally use. If you roll on your body, apply Infadolan for many days after dermarolling, especially if you do intensive treatments like single needling or dense stamping/rolling. Dermarolling / Microneedling / How long to expect .5 mm to last? We based our rough estimation on the "worst-case" scenario: That you roll very extensive areas in one session. For example, hyperpigmentation on the décolleté plus stretch marks on the abdomen, hips and inner thighs in one session. How long a dermaroller stays sharp depends on how large skin areas you roll and how tough your skin is. You should also avoid boiling water on the needles (that can blunt the needles). A short-needled dermaroller doesn't have to be as sharp as a long-needled one because it does not have to penetrate very deep. One of the effects of dermarolling is increased skin thickness, so yes. It is not really known how long the impaired healing lasts (due to thinned and dried out skin) after Accutane had been stopped but many plastic surgeons refuse to operate or perform an invasive procedure (laser, acid peel etc.) on patients for up to two years after Accutane. Likely, the skin goes slowly back to the pre-Accutane state once it is discontinued but it can take years. Thank you, Arachne, for your replies and suggestions. Can you please post your great idea and advice how to use it (the wine bottles' vacuum pump) in the suctioning thread? I have been looking for some improvised solution for suctioning for a long time because the professional machine used in the study is way too expensive for home use. Wait two more weeks. Then start using either the single needles or a 1.5 mm dermastamp (very suitable in your case) and the suction method. Stamp aggressively every three weeks and use the suction method in between the stamping sessions. There is a lot of missing tissue in the scars and it takes a long time to rebuild it. Dermarolling / Microneedling / Using vit. C really necessary? Thank you, Soon, again for your reply and feedback! No, vit. C or any other products are not absolutely necessary. Dermarolling will certainly work without them as well. They are just additional means to establish "ideal" conditions in the skin for regeneration and good functioning. Vit. C, if used regularity, also partially prevents further sun damage (sun damage is the main cause of skin aging). In combination with sunscreens of course. If your skin gets irritated by it, dilute it with more water. Do not use any cleansers or toners immediately after dermarolling, especially after dermarolljg with long needles (> 0.5 mm). Just rinse your skin with tap water, let dry and apply something protective and very moisturizing. Oils are very suitable for dermarolling immediate aftercare but not etheric oils such as Tee Tree oil. You can apply Tee Tree oil cleanser a day after. Dermarolling / Microneedling / Vitamin C: How long do the crystals last? Dermarolling / Microneedling / Results or Microswelling? The reason why long-lasting serious acne leaves scars is because acne causes intensive, long lasting skin inflammation and intensive chronic inflammation eventually damages the skin, it results in skin atrophy: Indented scars. The missing skin of the intended scar has to be rebuilt and this can take a long time. Collagen production is a slow process and it goes through several stages. It can take months to see results. Softening of scar edges (by crushing the scar tissue) after one dermarolling/needling session is certainly realistic. If the scar edges collapse, the scar will become less indented. But I cannot tell you whether this happened in your case or not - it would be nice to get feedback from you, how the skin situation continues. wanted to give up dermarolling after a year of monthly sessions because there were no significant results but they decided to continue and after a year and a half they finally are getting satisfactory, visible results.